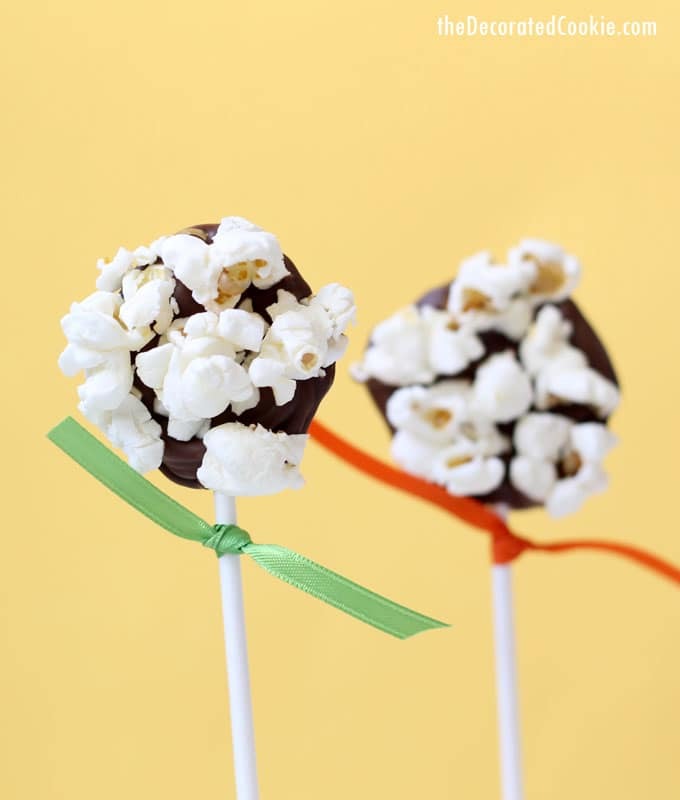 Chocolate popcorn pops, the perfect snack/treat? You’ve got the whole easy, no-bake, minutes to make thing. And you’ve got the whole sweet and salty combo thing. 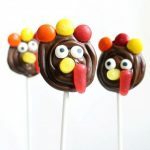 And you’ve got the easy-to-eat-because-there’s-a-stick thing. So sure, let’s go with perfect. 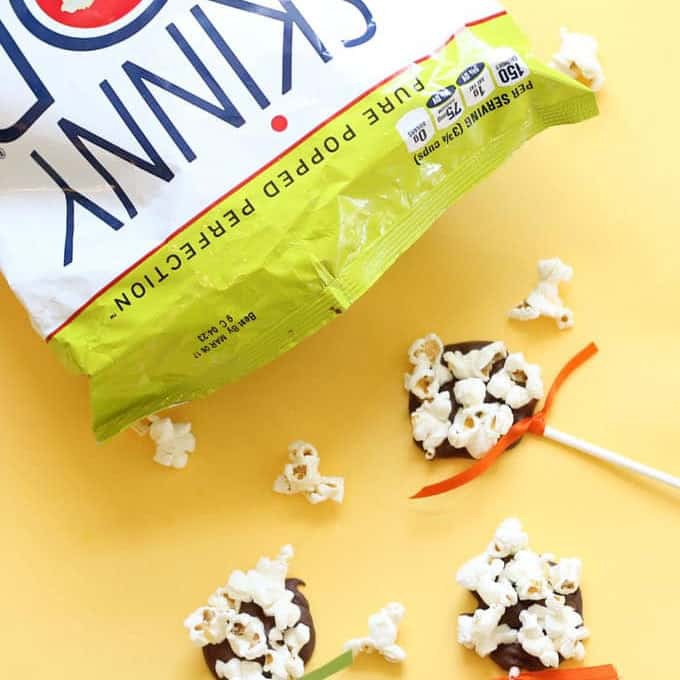 These are a handy, kid-friendly snack to have at gatherings and holidays, too. Hint: Like Thanksgiving. Add colorful ribbon and prop in a Styrofoam block that’s been wrapped in tissue paper and you’re good to go. 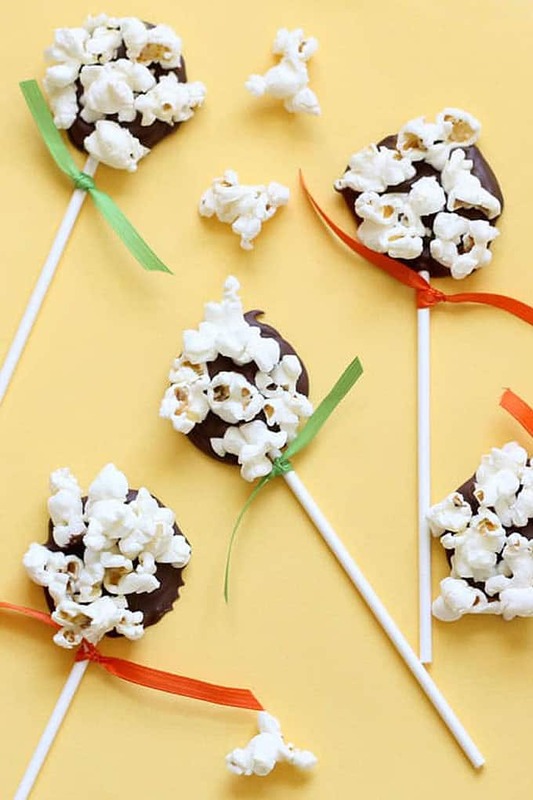 I used SkinnyPop popcorn to make these along with milk chocolate chips, and you can use any of your favorite popcorn. 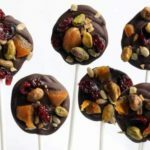 You can substitute dark chocolate or vegan chocolate as well. 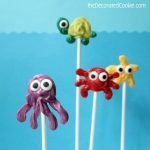 Find the lollipop sticks and disposable decorating bags in the craft store (or see below for affiliate links). Line a baking tray with wax paper and set aside. Pour the chocolate into a microwave-safe bowl. Melt the chocolate according to package directions. 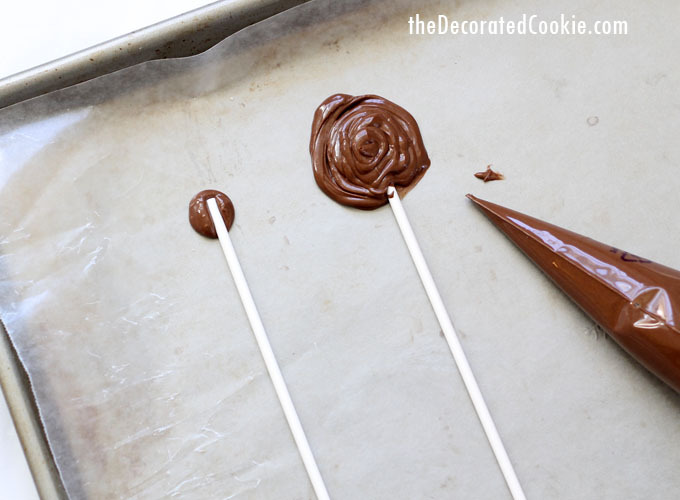 Pour the melted chocolate into the disposable decorating bag, twist the top and cut off about 1/4 inch from the tip. Pipe a dot of chocolate on the tray. 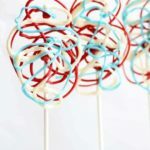 Place a lollipop stick on the dot and pipe a circle of chocolate on top, about 2-inches in diameter. 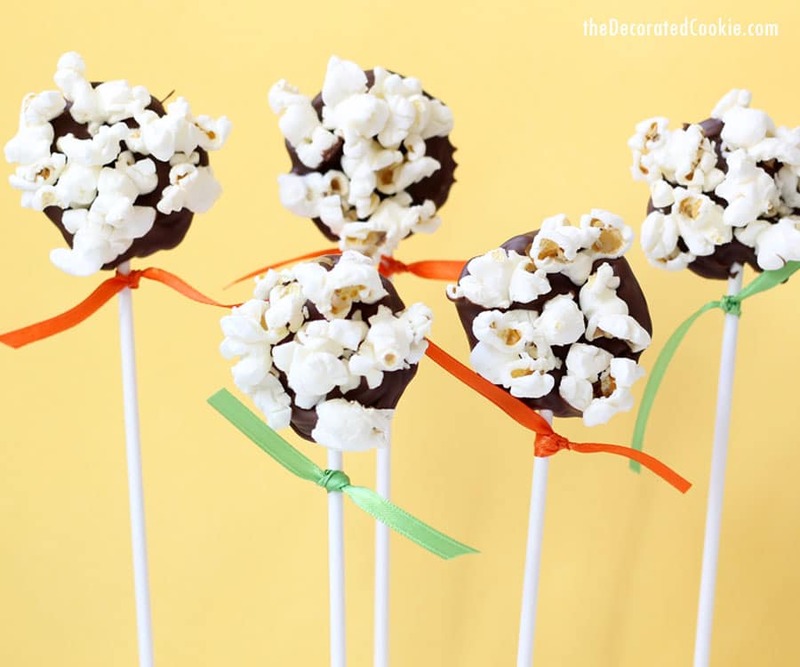 Sprinkle some popcorn over the chocolate, pressing into the chocolate. Fill the tray(s) and let set at room temperature or in the fridge until well set, a couple hours. 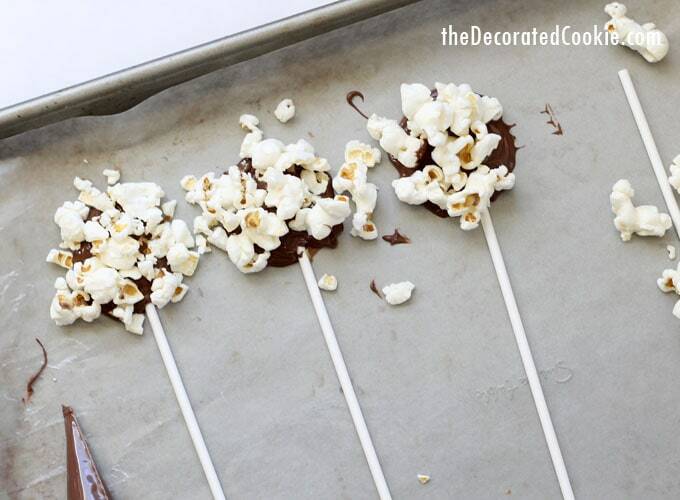 Remove from the tray, shaking off any popcorn (there will be some that didn’t stick).